Happy Friday everyone! 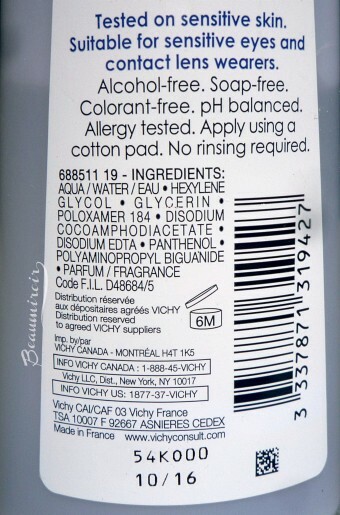 For this week's #FrenchFriday post, let's take a look at a micellar water by French skincare brand Vichy. You know that micellar waters, those no-rinse liquid cleansers that remove makeup, cleanse and tone in one swipe, have been big in France for a while and started to gain popularity in the US more recently (see all my micellar water reviews). What you may not know is that the French skincare market is dominated by brands which base their products on thermal water, a type of spring water that is rich in minerals and trace elements, and believed to have health benefits. Vichy is one of those brands, as are Avène and La Roche-Posay, just to name the most famous. Vichy thermal water is thought to soothe skin redness and irritation. That's why this micellar water is called Pureté Thermale 3-in-1 Calming Cleansing Micellar Solution. The formula is also alcohol, soap and colorant-free, but it does contain fragrance. Fragrance is actually the last ingredient in the list, which means that there's a very small amount of it. It has a very light, clean scent that made its regular use more pleasant for me. This micellar water contains very mild cleansing agents, and I did find it very gentle on my skin and sensitive eyes. Unlike the disastrous REN micellar water, it never caused any redness, burning sensation or irritation, even when used on my waterlines to remove eyeliner. The main quality that makes a micellar water a succes or a dud is the makeup removing power: different waters have vastly different results when used to take off makeup! I would say that Vichy Calming Cleansing Micellar Solution does a good job at makeup removal. It's not the most efficient I've ever tried (that award still goes to Lierac's) but it's reliable enough to remove light base makeup, like tinted moisturizer, powder and blush, and non-waterproof eye makeup. If you use waterproof or very long-wearing mascara or liner, you might feel like Vichy's Micellar Solution is not powerful enough to remove it quickly - in fact, most micellar waters won't be, and you'd be better off relying on an oil-based cleanser. However, if you wear lighter, more subtle makeup daily, Vichy Pureté Thermale Micellar Solution will do the job. My favorite way to use micellar waters in general, and Vichy's in particular, is actually as a morning cleanser. It's perfect to cleanse the sweat and oil off my skin as I'm coming out of bed, and it does so very gently, without the drying effect that a foaming cleanser and tap water would have. This micellar water leaves my skin feeling refreshed and clean, and doesn't cause any stickiness or greasy feeling. Overall: Vichy Pureté Thermale 3-in-1 Calming Cleansing Micellar Solution is a solid choice if you're looking for a micellar water. 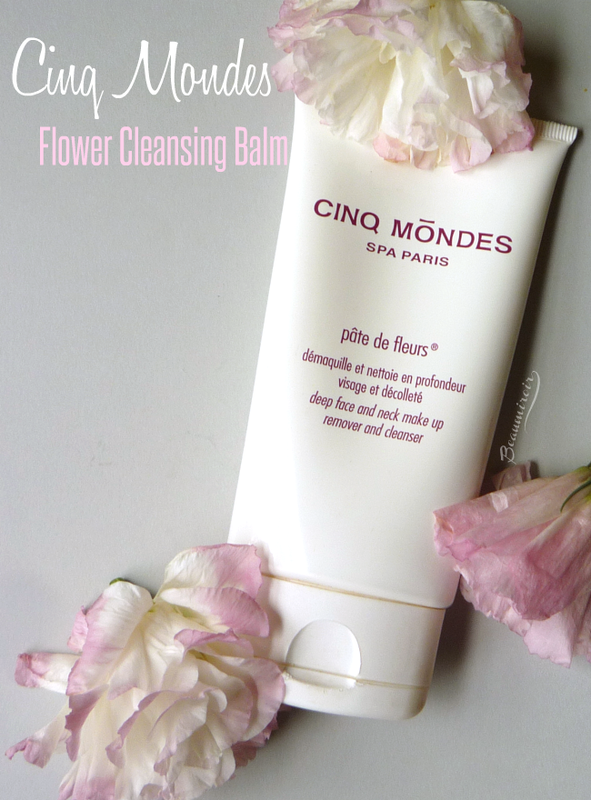 It removes light makeup well and cleanses the skin thoroughly while remaining very gentle. I swear by the Bioderma one. Do you know how they compare? I'm personally not a fan of the Bioderma micellar water, despite the hype that surrounds it. I don't like how it smells at all, and it leaves my skin a little sticky. I really prefer the Vichy to that one! Personally I think the VICHY gentler than the Bioderma, especially on the eyes. And LOL - they really do repackage frequently. I've never tried micellar waters! It really didn't sound like something for me until you said you liked to use it in the morning. That actually sounds perfect for a morning routine! Especially if you're in a hurry. I might have to check this out. I really do want to try quite a few items from Vichy. My list is growing! Morning cleansing is my preferred use for micellar waters! They excel in this role, even the ones that are not so good at removing mascara. If you shower at night it's a great way to cleanse your face in a few seconds without using tap water, which is often very drying! What's in your Vichy list? I'm curious! They have gone through so many packaging designs huh? I wonder why! :D When it comes to cleansing water, I've been loyal to the Koh Gen Do Cleansing Spa Water. It cleans so well so I haven't felt the need to try anything else. But I've been so tempted to try these micellar waters many many times, though! I really don't know why they keep changing the packaging, it's weird, right? Hey Lulle, thanks for the review! I've never tried this one, although it seems like whatever micellar water I try, I end up going back to Bioderma Sensibio. I prefer unscented products if I had the choice, and that one is! Have you tried the Eucerin? They don't sell their micellar water here in the US, but I used it in France, and if I remember correctly, it's unscented. It's also very good, I preferred it to the Bioderma (which leaves my skin feeling kind of sticky). I am currently using this one to remove my makeup and sunscreen. At first I was worried this wouldn't be as effective as cleansing oil but so far it is good since I use a foaming cleanser with this anyway. It is actually great to take a break from cleansing oil. 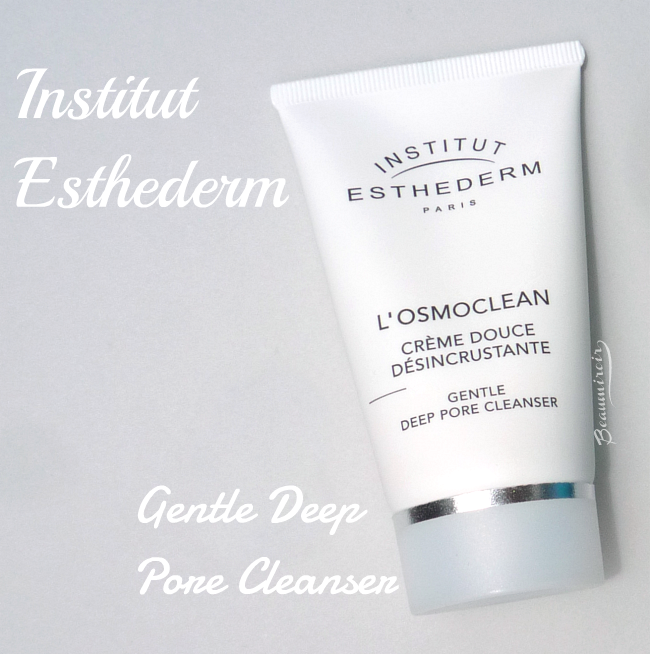 I think it works well in a 2-step cleansing routine, or even by itself for people who wear only light makeup - and it's the case for all micellar waters really. I'm not sure what the current US version looks like, they changed the packaging so many times that I'm lost! My bottle, although bought very recently, might not feature the last look!